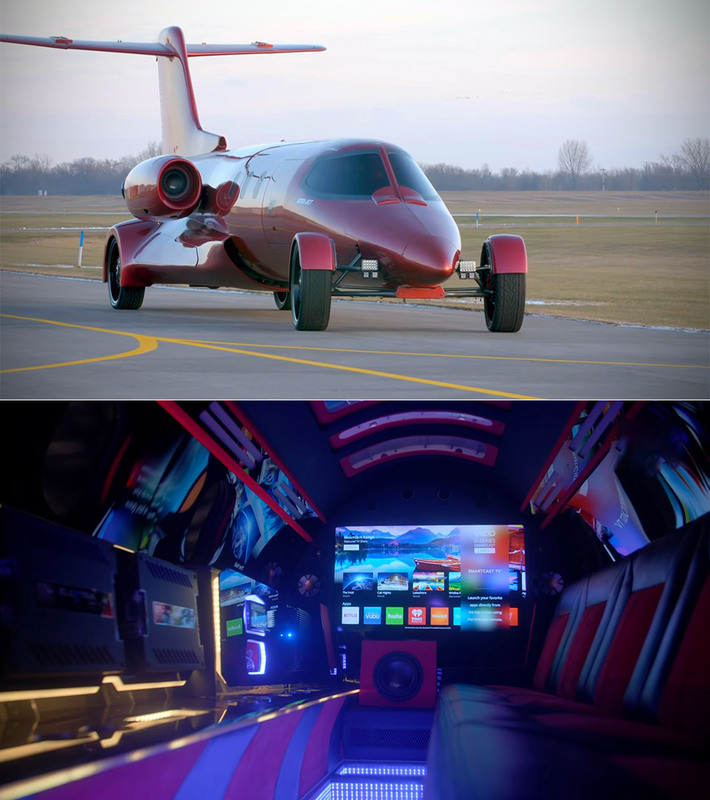 This one-of-a-kind vehicle cost more than $1 million to build and can transport up to eight passengers in pure luxury, thanks to four 28-inch wheels attached to a wingless Learjet fuselage. The project was in the making for 12 years, and is the brainchild of designer Dan Harris and co-owners Frank DeAngelo and Dima Kashevatsky. Both wings had to be removed for the vehicle to become street-legal, but the jet engine nacelles remain, and house two 12-inch subwoofers surrounded by neon lights. When you’re ready to step inside, a set of fold-down stairs drop down, where neon lights illuminate the interior, alongside a large TV screen, more speakers, and a host of amplifiers. In the cockpit, there’s a single driver’s seat and four monitors on the custom dash. Read more for a video and additional information. “These screens are hooked up to external cameras to allow the driver to see around the giant car during its various voyages. Keeping the jet theme going, above the driver’s seat, in the ceiling of the limo sits a bank of toggle switches which activate the car’s custom disco lighting, as well as the lights in the special ‘Infinity Mirror’ floor,” reports Barcroft Cars.